Announcing: The Release Date for Hank #59! Are you as excited as we are about reading The Case of the Perfect Dog? Well, keep your eye out for upcoming news and contests related to the release of this exciting new addition to Hank's adventures! Hank the Cowdog book #59 will be available to order as of March 16th, with all orders shipped to arrive at the same time as their release in stores (March 29th). The Case of the Perfect Dog . . .
Who can stay mad at a Lab? 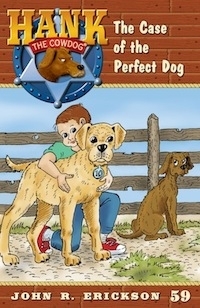 When a strange twist of events brings a yellow Labrador onto the scene of a roundup gone wrong, the entire ranch quickly falls in love with this newest addition to the ranch's Security Division. Who can help loving a Lab? Hank quickly begins to feel the pressure of measuring up to this perfect dog, but it isn't long before everyone begins to notice that their sweet new pet, Happy, has a few personality quirks of his own. Will Happy stay on the ranch forever? Will Hank manage to solve the crisis that erupts when Happy's quirks get out of hand, before Happy eats the ranch into bankruptcy? As always, we love to read your comments and emails, so be sure to let us know what's on your mind!